A mild winter could be in store for much of the United States this winter according to the NOAA Climate Prediction Center. 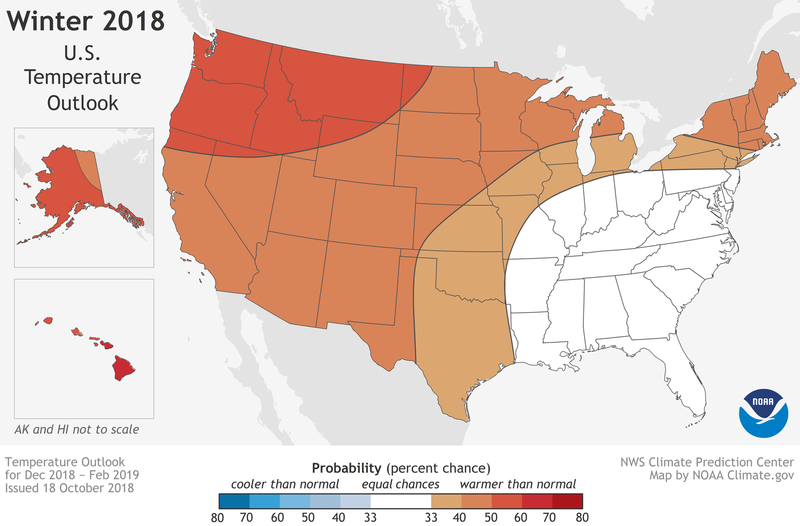 In the U.S. Winter Outlook for December through February, above-average temperatures are most likely across the northern and western U.S., Alaska and Hawaii. Additionally, El Nino has a 70 to 75 percent chance of developing. We expect El Nino to be in place in late fall to early winter, said Mike Halpert, deputy director of the NOAA Climate Prediction Center. 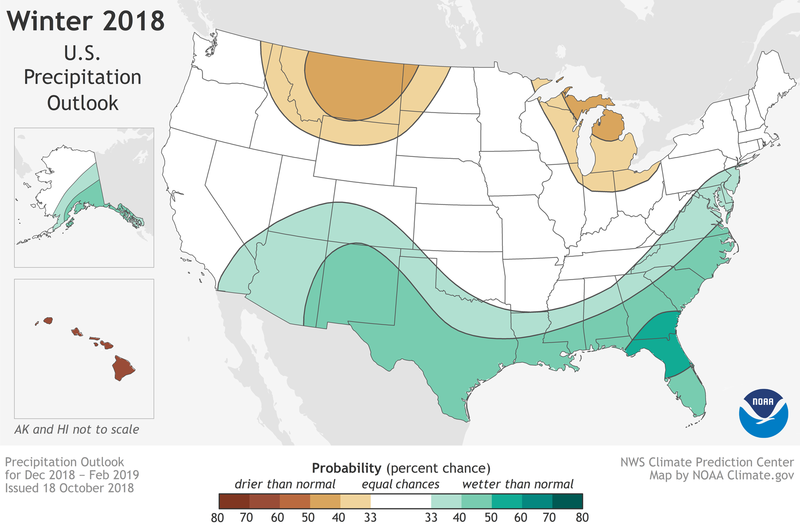 Although a weak El Nino is expected, it may still influence the winter season by bringing wetter conditions across the southern United States, and warmer, drier conditions to parts of the North. Other climate patterns that can affect winter weather are challenging to predict on a seasonal time scale. The Arctic Oscillation influences the number of arctic air masses that penetrate into the South and could result in below-average temperatures in the eastern part of the U.S. The Madden-Julian Oscillation can contribute to heavy precipitation events along the West Coast; which could play a large role in shaping the upcoming winter, especially if El Nino is weak, as forecasters predict. The NOAA seasonal outlooks give the likelihood that temperatures and precipitation will be above-, near- or below-average, and how drought conditions are expected to change, but the outlook does not project seasonal snowfall accumulations. Snow forecasts are generally not predictable more than a week in advance. Even during a warmer-than-average winter, periods of cold temperatures and snowfall are still likely to occur. 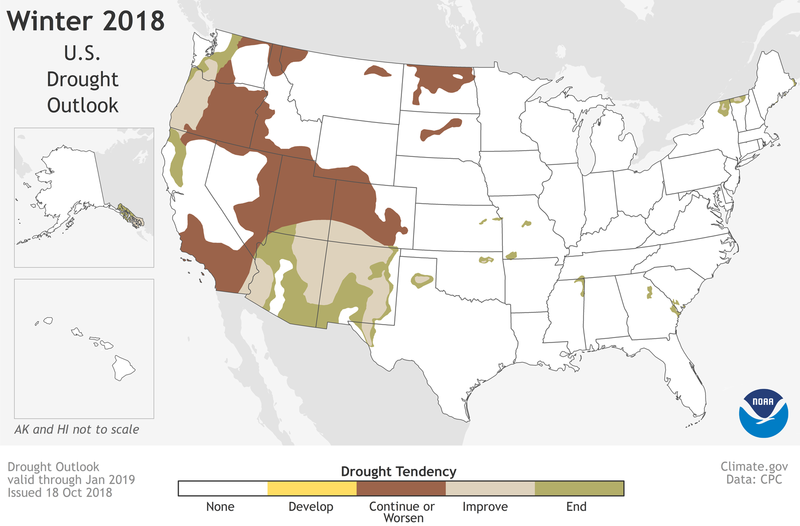 The NOAA Climate Prediction Center updates the three month outlook each month. The next update will be available on Nov. 15. NOAA produces seasonal outlooks to help communities prepare for what is likely to come in the next few months and minimize weather's impacts on lives and livelihoods. Empowering people with actionable forecasts and winter weather tips is key to the NOAA effort to build a Weather-Ready Nation. Source: NOAA, U.S. Department of Commerce, News & Features.